Plug-in developers Brainworx have released bx_console E — a new 72-channel emulation of the SSL E Series console, complete with compressor/limiter, expander/gate, four-band parametric EQ, and wide-ranging high- and low-pass filters. The new plug-in pairs these features with the same flexible signal routing found on the original console. 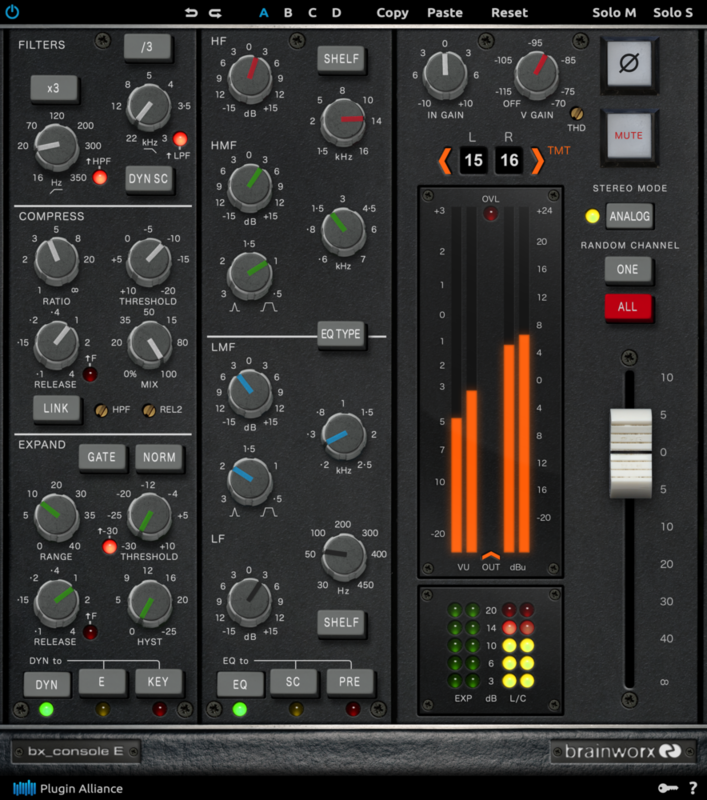 The plug-in applies the same Tolerance Modelling Technology (TMT) used in their previous bx_console channel strip plug-in to simulate the channel-to-channel variances of the E Series’ electronic components on each and every instance of the plugin. And, Brainworx claim that the plug-in has an extremely low CPU load. Brainworx’s bx_console has the added advantage of letting you choose — on a per-channel basis — between the original console’s EQ revisions ('black' or 'brown') or to substitute the compressor’s VCA (Voltage Controlled Amplifier) with that from the later-released British G Series console. 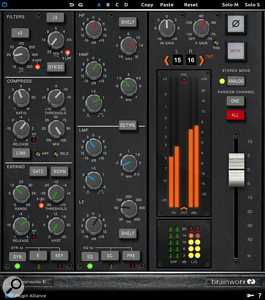 Brainworx have added a wealth of modern functions to the E Series’ vintage circuitry such as: a dry/wet control; an optional secondary release time (REL2) control that prevents the compressor from pumping on delicate acoustic tracks, and an adjustable HPF (High Pass Filter) for the compressor’s sidechain. There’s also a continuously-variable THD (Total Harmonic Distortion) control that adds saturation; two alternative threshold ranges for the expander and gate; the gate’s HYST (Hysteresis) control which sets a dedicated closed threshold up to 25 dB lower than the open threshold, preventing sustained guitar notes and ringing cymbals from making the gate stutter. A continuously-variable Virtual Gain knob adds simulated analogue noise to any of the channels and EUCON parameter mapping is provided for Avid controllers. The bx_console E plug-in is available in AAX Native & DSP, AU, VST2, and VST3 formats exclusively from Plugin Alliance. It has an introductory promo price of $179 until August 31, 2017, rising to $299 thereafter. A fully-functional, 14-day trial is available to anyone registering for a free Plugin Alliance account here: http://www.plugin-alliance.com/en/registration.html.